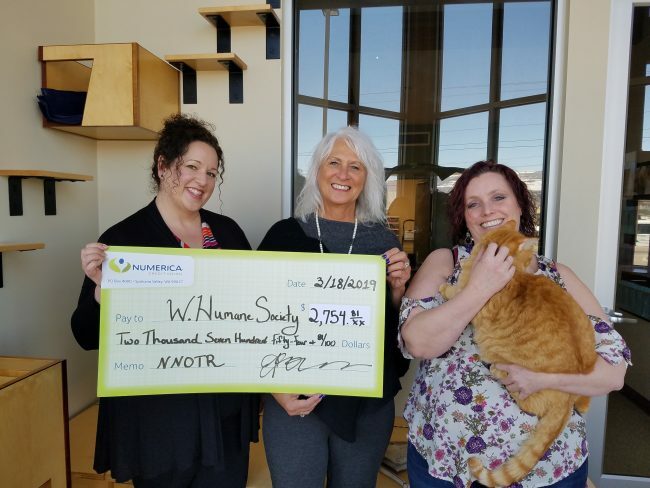 From left to right, Jessica Clay, business development officer at the $2.2 billion Numerica Credit Union in Spokane Valley, Wash., presents a $2,754.81 check to Dawn Davies, executive director of Wenatchee Valley Humane Society and Renee Parkins, development chair of Wenatchee Valley Humane Society. Funds were generated during the Numerica Night on the Ridge fundraising event this past January. Proceeds from the event benefited the Wenatchee Valley Humane Society, a resource center providing a variety of services including caring for displaced pets, rescuing injured and lost animals, spay/neuter programs, keeping families and pets together in times of need, providing a pet food bank, behavioral modification, investigating animal cruelties and adoption services.